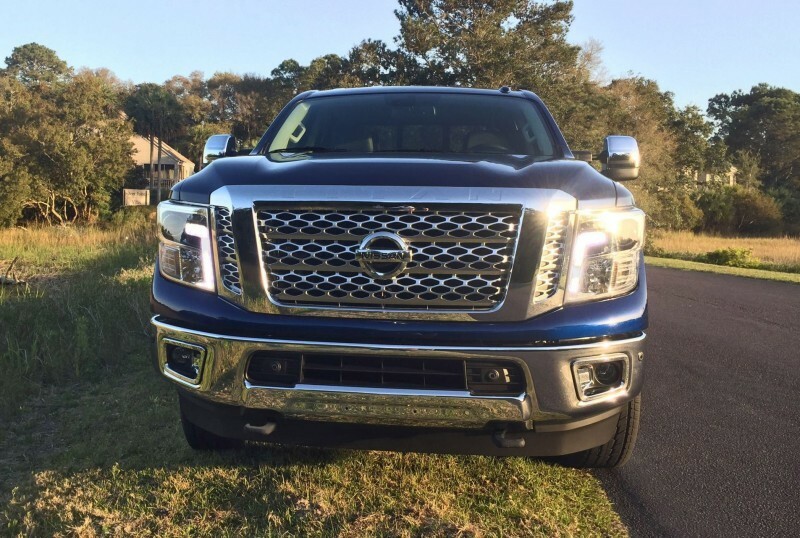 Review + Videos – 2016 Nissan TITAN XD 5.0L Cummins TDV8 – The CRUSHER is HD Truck of the Year! As you may have noticed, there is usually lead time for these full reviews after the cars leave the CRD speed fleet. Time to process and refine the review content is usually really helpful, despite that seeming counterintuitive. Not in this case. Titan XD jumps the line, and is firmly top-of-mind a day after its departure. The Titan XD blew us away so thoroughly with its unique skills and capabilities that we’re tempted to name it HD Truck of the Year. Not just tempted, it’s done. This is our HD TOTY for 2016. 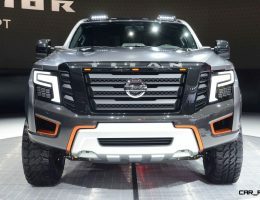 Diving in deep yesterday for the drive videos helped crack the Titan XD’s code — and make sense of Nissan’s strategy to become a trucking hero with the Titan’s complete relaunch. Is the Titan XD perfect? No, it is not. But does it perfectly solve a long-running pickup truck mystery? 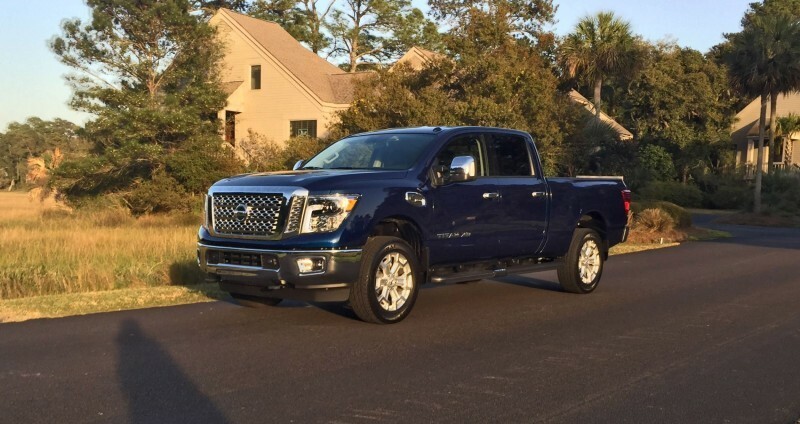 With innovative, high-tech solutions that break the half-ton 1500 vs one-ton 2500 ‘rules’ the truck business? Oh yes. All that and more. 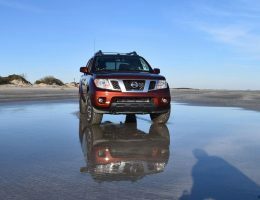 Two videos and a few dozen photos of “The Crusher,” our affectionate nickname for the Titan XD during its weeklong Spring Break here in the Carolinas. Plus the standard headings of Exterior, Interior, Performance and Pricing. 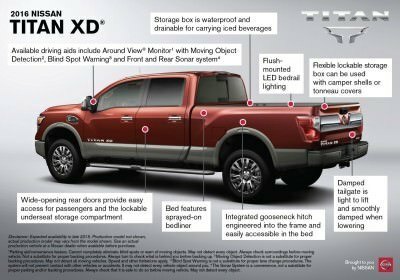 Spoiler Alert: The Titan XD tows like a 2500, but drives smoothly and corrects the normal HD/Super Duty compromises in handling, driver control and refinement. All at pricing that is temptingly low for an all-new, next-gen turbodiesel V8 from Cummins. First things first, the new Titan XD is massive. 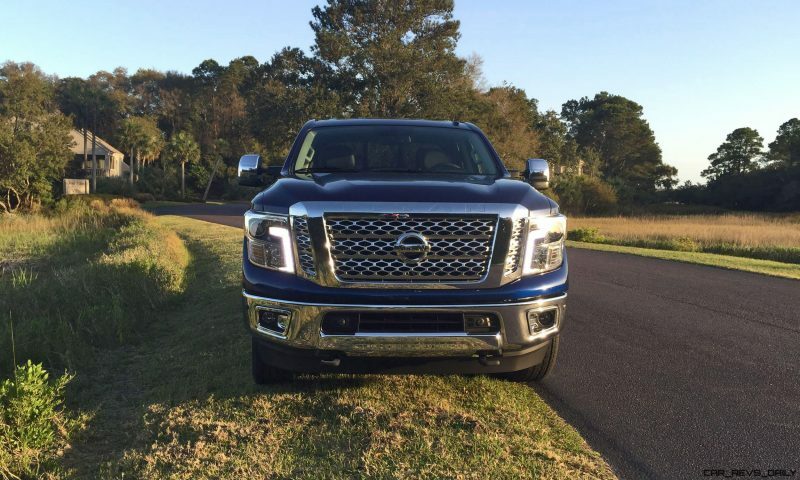 Far larger than you are expecting — and very close indeed to the towering stance and imposing hoodlines of the Sierra 2500HD and F-250 Super Duty models from GM and Ford. 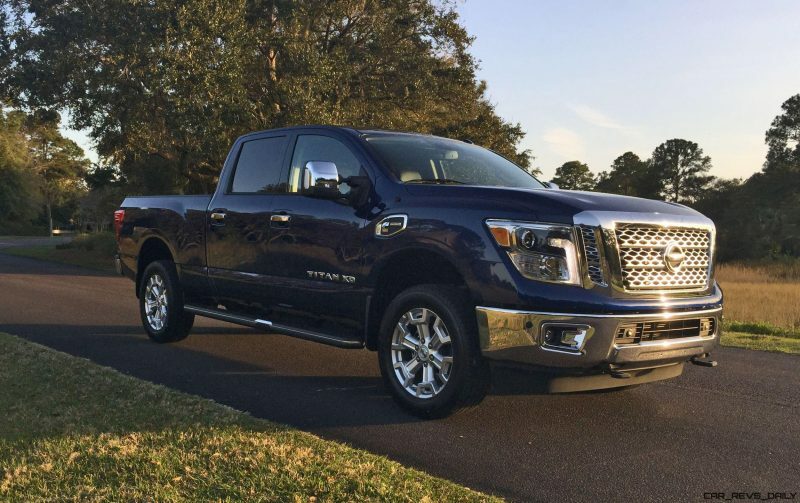 That reaction in the flesh is surprising — in photos we’d pegged the new Titan as a pure F-150 rival. Oh no. Much more than that. Literally! The new nose and hood design are gigantic for a reason: they were custom-adapted around the Cummins turbodiesel V8 of our test truck — the only launch engine of the Titan XD so far in 2016. 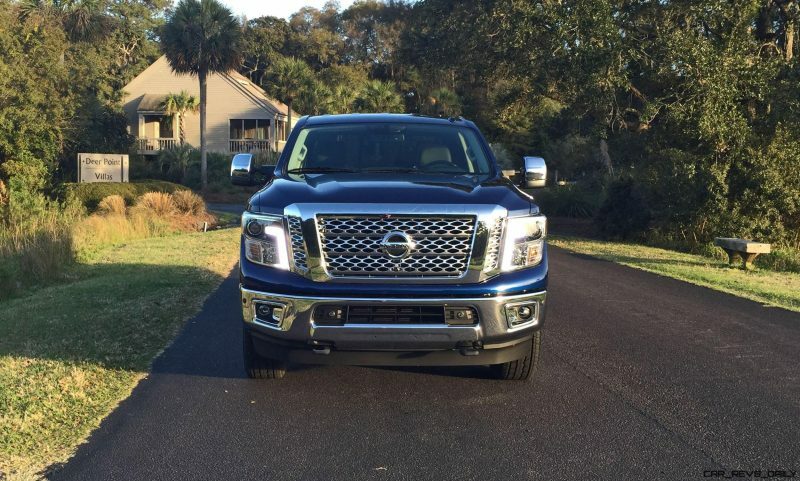 XD, you see, means “Every Duty” in Nissan-speak. 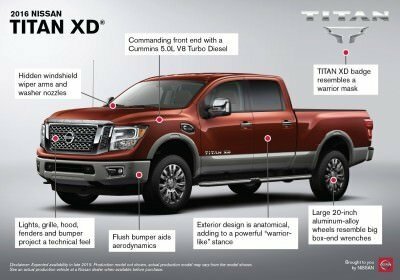 So the upcoming gasoline V8 will also wear the Titan XD badge. It is all very imposing, and very impressive, if not classically beautiful on first sight. 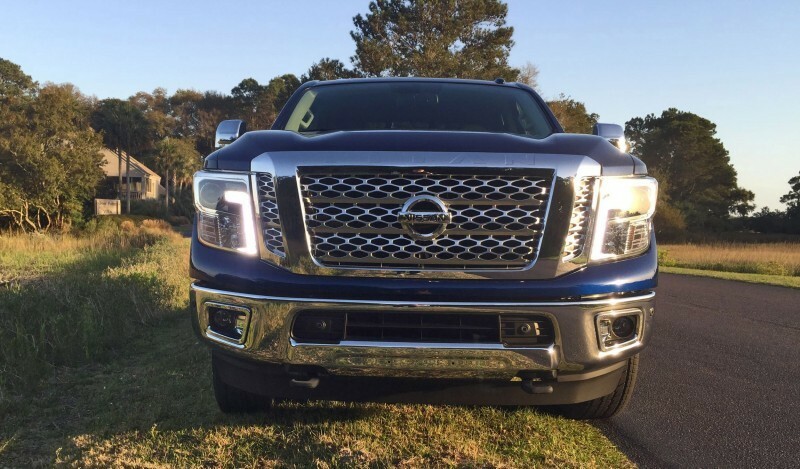 The bluff and near-vertical face of the new Titan XD makes its first impression much more HD than any other half-ton truck. The Titan XD Pro4X is even cooler, with contrast paintwork, fender flares and other tweaks vs the plush SL 4WD here. 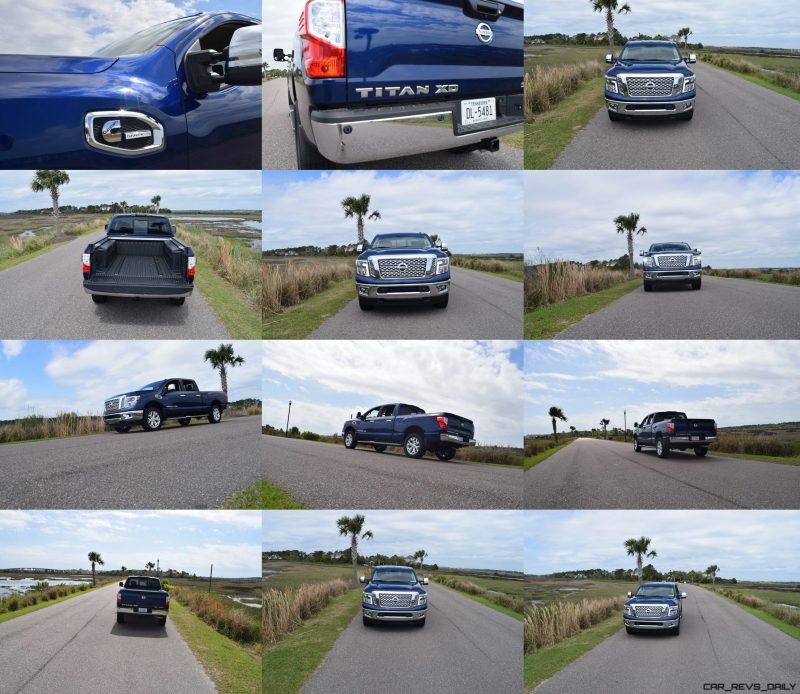 In isolation, we found the Titan XD’s pure nose angle to be very reminiscent of the NV2500 vans — and not in a great way. This definitely lifts the status of the NV more than the Titan XD benefits from the familiarity. But then you look closer, and see massively more hood height and length. A much more steeply-raked windshield, and of course a ride height to match the Titan’s new XD bulk versus the vans. Then the fireworks start: you note the “C” Cummins badges in the front fenders — drawing more admiration in traffic than you would ever imagine. 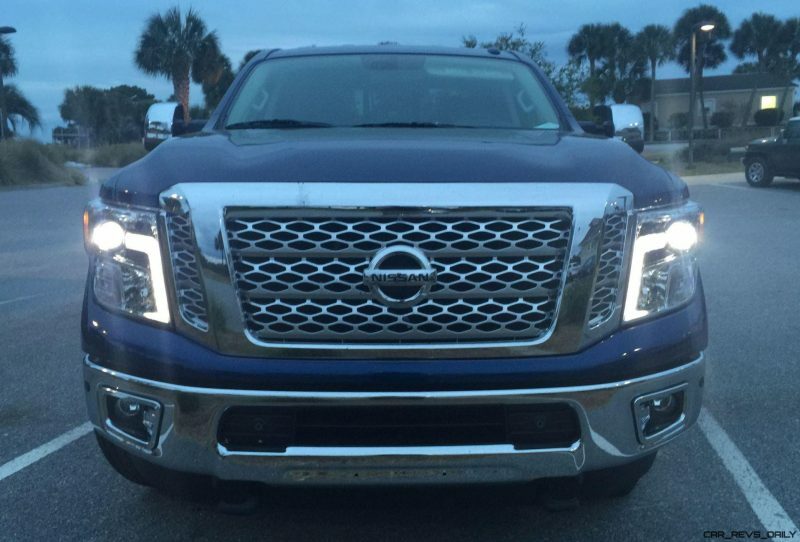 Your eyes light up with the bright and sharp vertical cheekbones of LED DRL lighting. Twinkles keep on coming as the HID low-beam projector beams light up and add to a mean, serious stare on the highway. This is a face that clears the fastlane like a rocket bulldozer in your rear-view mirror. Interesting new musculature in the profile, fender flares and overall look helps the Titan XD to feel fresh and extra unique from the profile and tail angles. 20-inch wheels on the SL 4×4 test truck are strong, chunky six-spokes that seem perfectly sized to the gigantic fender openings, even on these road-biased tires. Then the lights out back are slightly less fresh than we’d hoped, with incandescent bulb elements for the main brakes and blinkers. We did love the very bright LED bed lighting back there, though! And a very fresh look to the chopped clear/red elements, deep Titan branding and jumbo badges all make clear: there is a new Boss Hog in town. 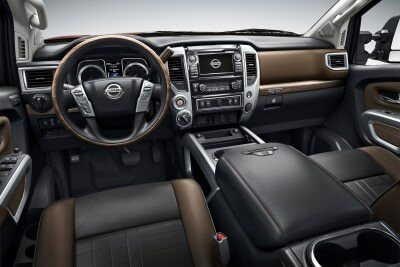 The cabin of the XD is virtually unrecognizable to current Titan owners. Beside the Nissan badge in the four-spoke steering wheel, most would be hard-pressed to know where this plush rig comes from. Soft-touch elements for the upper dash now have contrast-stitching effect on their top edge — and this sets the tone for an immensely well-built, and simply immense cabin. There is a fantastic sense of width and airiness to the new Titan XD inside. 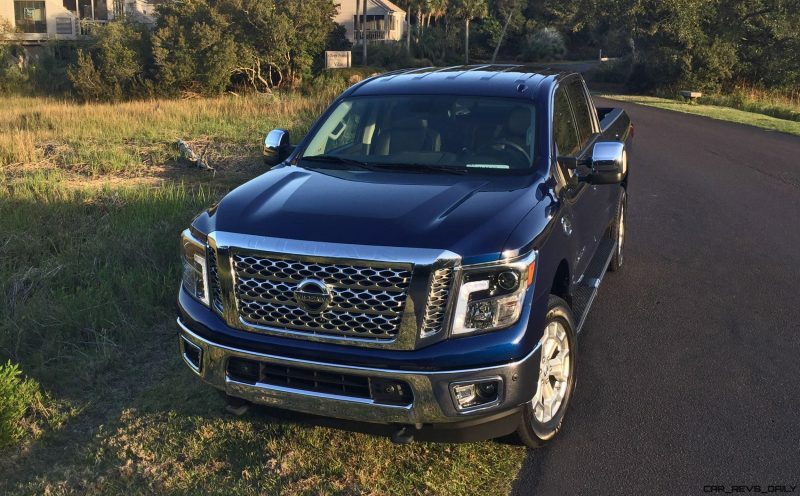 Great seats and a high, but confident, drive position are a hop away from the pavement via the fixed, full-length running boards. The power-adjustable steering column is fantastically adjustable, and avoids the tilted-up, city-bus feel of some HD2500 pickups. You are still massively high off the ground in the Titan XD’s driver seat, but also fairly ensconced and with arms-stretched ahead in a sports-car-ish drive position. The pedal placement all seems perfect, and the footwells are triple roomy, but also have a dead third pedal to brace your left foot when needed. The 8-way power driver seat of the SL 4×4 Crew Cab has power lumbar that is helpful. Deflated positions for the lumbar provide more lateral support than with the lumbar pillow blown up. But overall the Titan XD holds you nicely in corners — in a way that the previous-gen Titan and current Frontier are much more prone to tossing you around. Same goes for the Silverado HD, which can slam your hips around in corners. Especially if you are thinner than most Avg Americans. All good news then for the Titan XD’s captain. 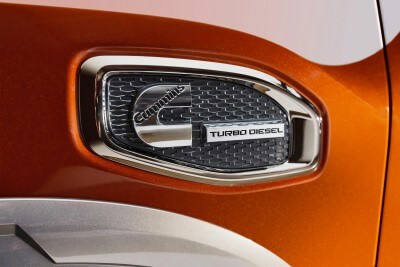 A tap of the remote-start from outside or the push-button ignition inside fires up the heart of the beast: a Cummins turbodiesel V8 so excellent that Ford and Chevy refused it buy it, and instead are fast-tracking the development of their own inhouse engine competitors. They think they can build their own for less money than the estimated $10k price for these crate motors when shipped to the Titan XD megafactory in Canton, Miss. Are they right? Is this size TDV8 the key to next-gen towing ability? 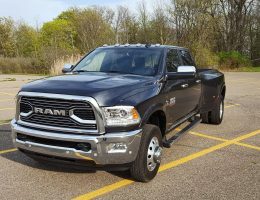 Lack of new 1500 diesel models beyond the 3.0-liter VM Motori TDV6 in the RAM proves the challenges in rolling out an all-new truck diesel motor. It must last for 200,000 miles of hard use/abuse, yet also be free of Clean Diesel stigma by including the best exhaust-treatments. And all at the same time, be able to justify its steep price premium over the existing gasoline engines. 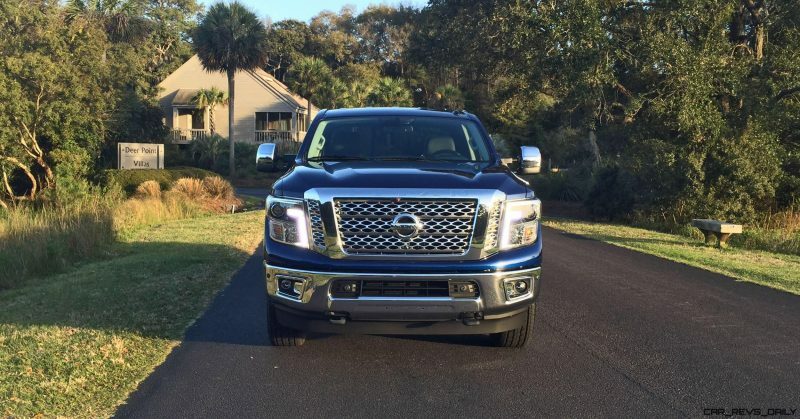 Nissan’s partnership with Cummins makes perfect sense. Leverage the long-standing brand cred of the Cummins name, and also leapfrog the other 1500 trucks to market. 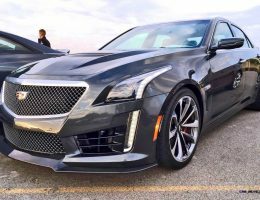 The specs alone speak clearly for themselves: 5.0-liter V8 with giant, twin-scroll turbocharger producing 555 pound-feet of torque, 310HP and nearly 20-mpg when driven gently. 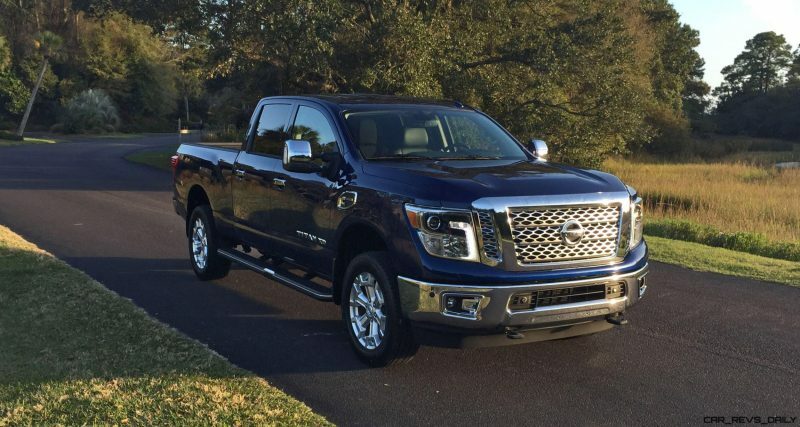 Yet also a hauling hero: 12,310 pounds is astounding weight for the Titan XD’s max tow capacity. 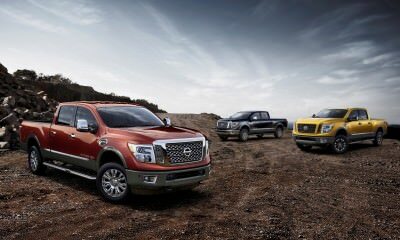 All Titan XD’s — with the diesel still standard until the new gas V8 arrives this summer — can haul at least 10,600 pounds. 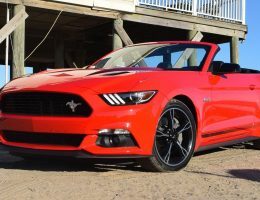 The sprint pace is 9.1-seconds to 60-mph, with minimal turbo lag. More notable is the long-travel throttle pedal. 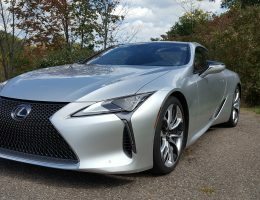 It is tuned to let you stay chill even in bumpercar traffic jams, where a jumpy throttle might have the truck eating that Prius in front of you. 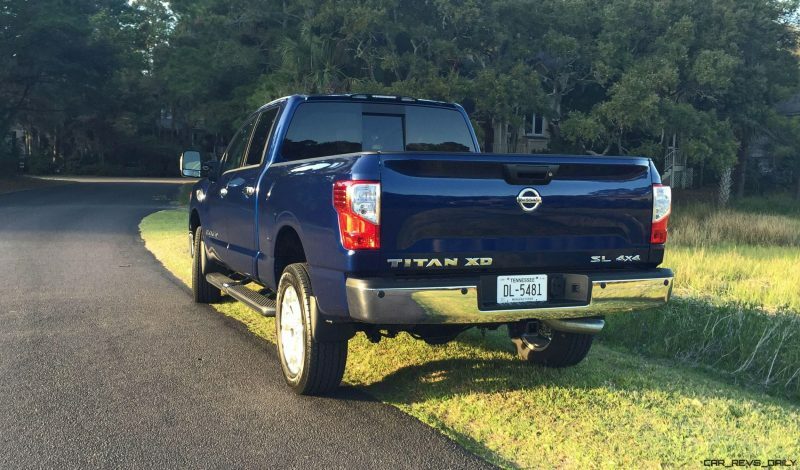 The Titan XD does it all: maintaining great passing and towing power even with weight out back. With respectable fuel economy while doing so. Very, very impressive achievements. 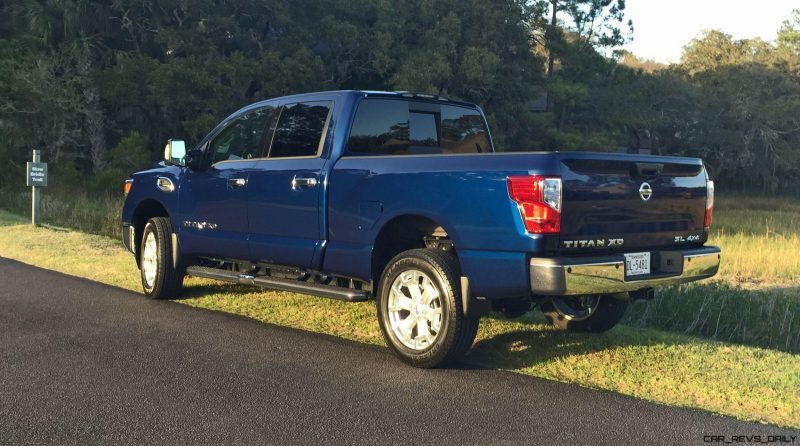 The six-speed automatic from Aisin is the second half of the Titan XD’s phenom new powertrain. 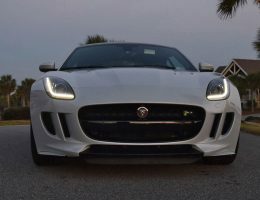 The Japanese supplier giant has worked double-time to make sure this new auto is up to the tasks at hand: reinforced torque-converter, heavy-duty cooling and internals, plus smooth gearchanges even at full throttle. 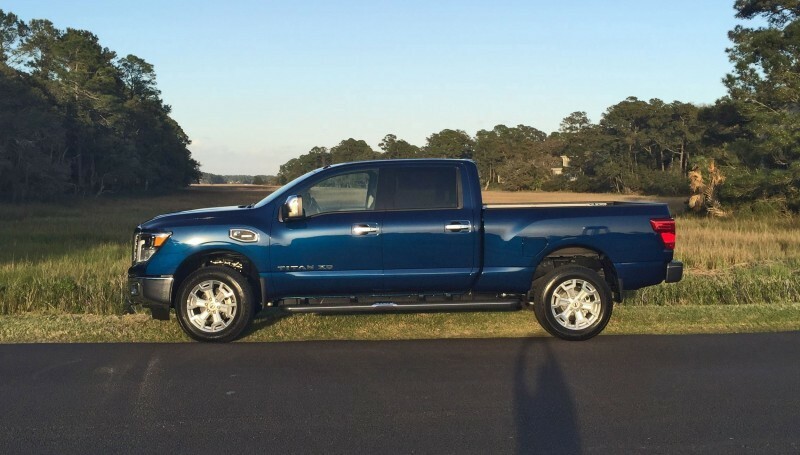 Incredibly impressive, and a big part of why the Titan XD Cummins is so much friendlier, and more controllable, than the 6.7L Cummins diesel six in the RAM 2500 HD. The first thing you notice, of course, on cold startup is the diesel clatter. It comes in loud and clear at idle and through town. A slight shock when coming from car-cars, but then notably unobtrusive. You even start to crave the whistle of turbo boost on hard throttle. Other drivers certainly do! 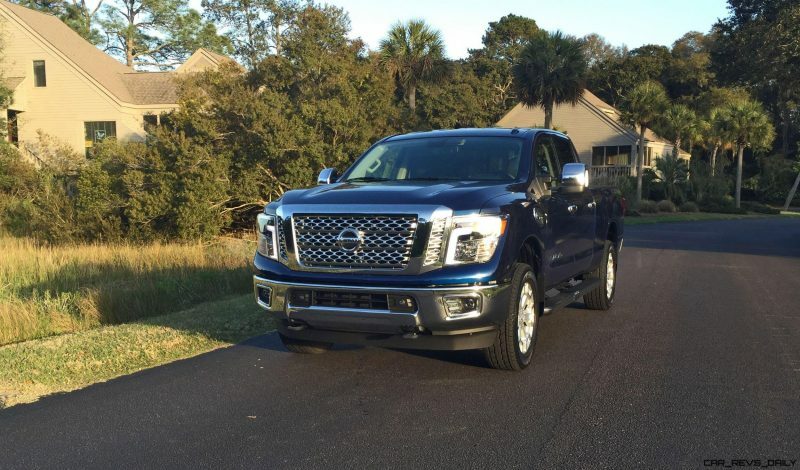 Titan XD clears traffic and turns heads in the Southeastern USA as much as any Porsche or even GT-R. 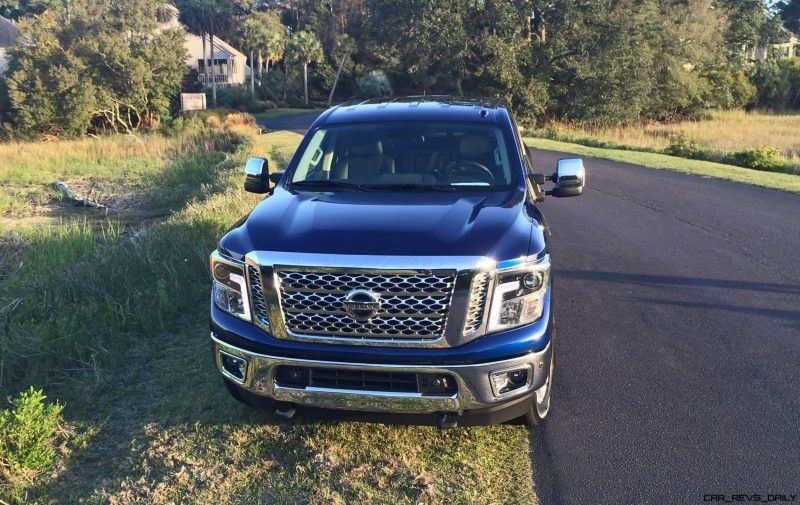 The Titan XD engineers obviously knew this engine is ‘vocal’ — to put it mildly — compared with the normal engine compartments they are used to insulating. 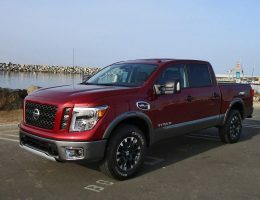 As a result, the Titan XD is triple-insulated like a Wraith all around the firewall, lower dash and throughout the cab. 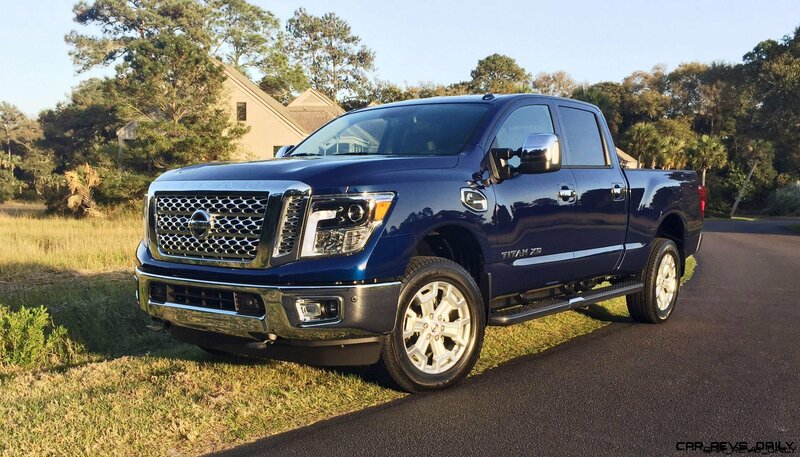 Once the diesel warms up and quiets down, you are left in awe at the refinement of the new Titan at speed. 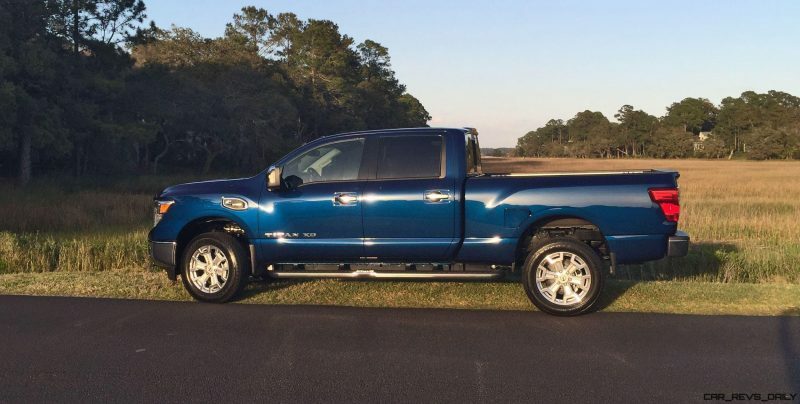 Wind, tire and exhaust noise are usually ever-present in big pickups, but are seriously silenced here. As you can see and barely hear in these videos…. the Titan XD has a charming and very modest thrummmmm on full throttle. NBD for this big rig, even with my hulking man-teets making an embarrassing appearance on video. To add to my shame… three subheadings that read like a Gilette ad, but are also quite relevant for the Titan XD’s performance. What strikes you is that the Titan XD is obscenely smooth. Even at full revs, cold idle, manual-override downshifts! 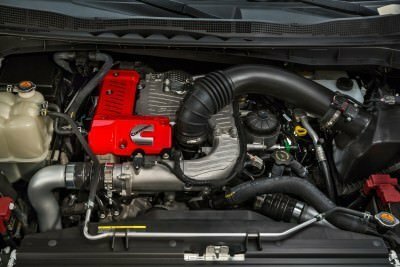 The Titan XD might have taken a full re-engineer to fit the Cummins V8 engine. But it is better for it. Smooth, chill and calm — when most gasoline V8s would be revving to heaven with a trailer out back. Stumbling through upshifts, and clunking downshifts. 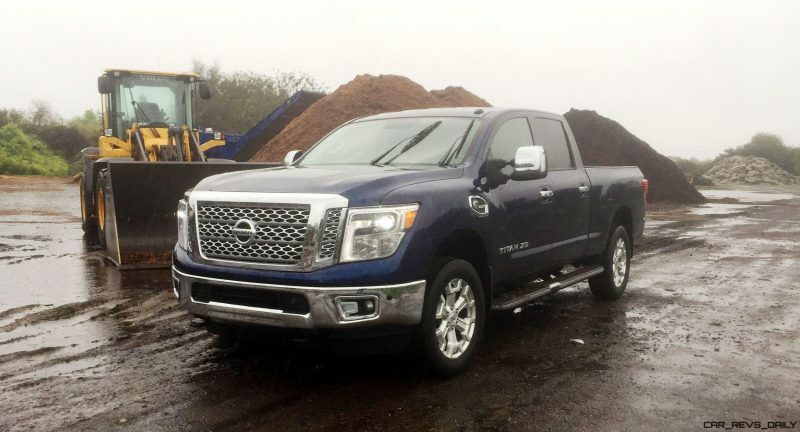 We did not get the chance to pull anything big out back, but the stump-pulling power of 555Lb-ft makes clear that the Titan XD’s drivetrain, brakes and handling are all up for it. 200%. We nerd out in the first video above, evoking Joan Rivers’ “Can We Talk? !” comedy bit. In order to break some hard truth about HD trucks. They are hard to drive. Period. So large, so wayward around corners. So loose in steering control, and bouncing like a trampoline Monday through Sunday. 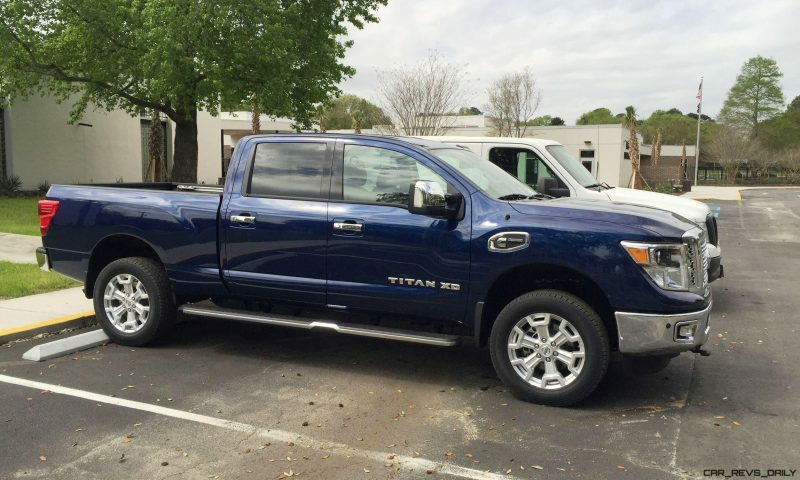 The Titan XD’s real achievement, for this admitted truck newbie, is that it can pull like an HD2500, yet drives and rides like a luxury SUV. Ultra narrow two-lane roads with old-growth Oak trees lining the shoulder? In most 1500 trucks, and all HD trucks, driving confidently in this scenario will take weeks of practice and familiarization. And all this HD bashing… gets worse with trailers in back. You have to focus; hands at ten and two like a trainee to keep control of all that mass. Even at straight ahead… most Super Duty’s need watchful, attentive driving styles that are stressful, at the very least. And just difficult, at best. 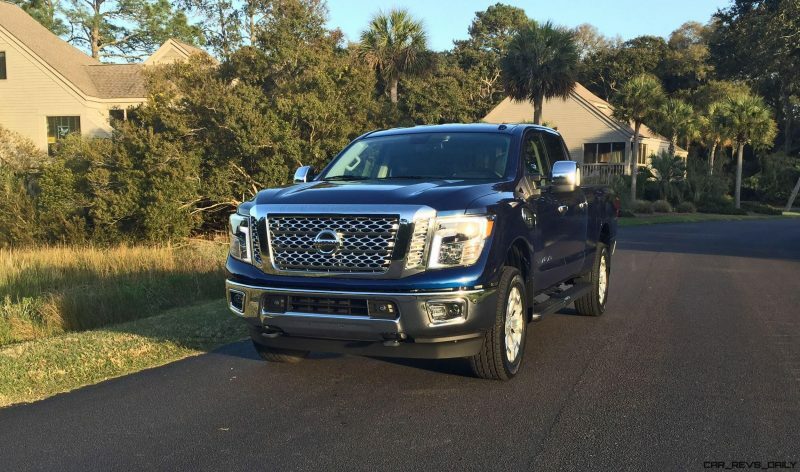 Our test Titan XD Cummins SL 4×4 Crew Cab is second from the top of the range, just below the Platinum Reserve model and its $57k base. The SL 4WD stickers from $55,030 and adds the same $1200 delivery charge to its out-the-door price as all the other models. 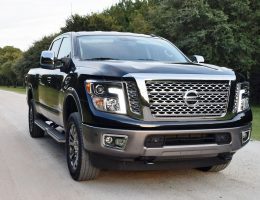 Options on the tester included $200 floormats, $1k twin Titan Box lockable bedside cubbies, a $350 remote-locked tailgate and mud flaps for $235. Grand total with destination? $57,490. Base pricing, mind you, is much friendlier. 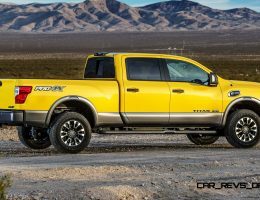 The new Titan XD Cummins is available from just $40,290 in its leanest form. 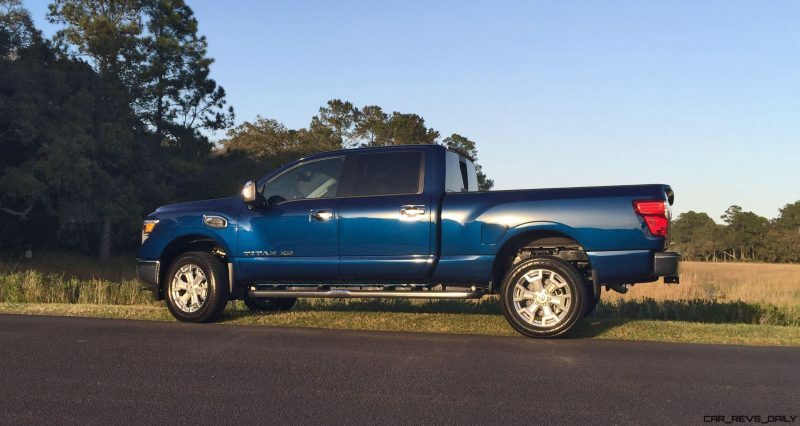 The prices can shock the old truck-think mentality of $40k top prices, but this isn’t 1999 no’ mo’. A Silverado HD2500 LTZ crosses the $70k mark in a hurry with just a few options. Don’t scoff: For most buyers, the machines are a deductible business expense every year. (And business requirement in many cases.) The big cost is not up front, but actually running the trucks for 15,000 miles a year. As anyone who recalls $100 tank fill-ups knows.. the diesel’s extra 5-10MPG at all times, and with all loads, makes a massive difference in lifetime running costs. Beyond the Titan XD being better value than the HD gang, it is also a terrific value in general. 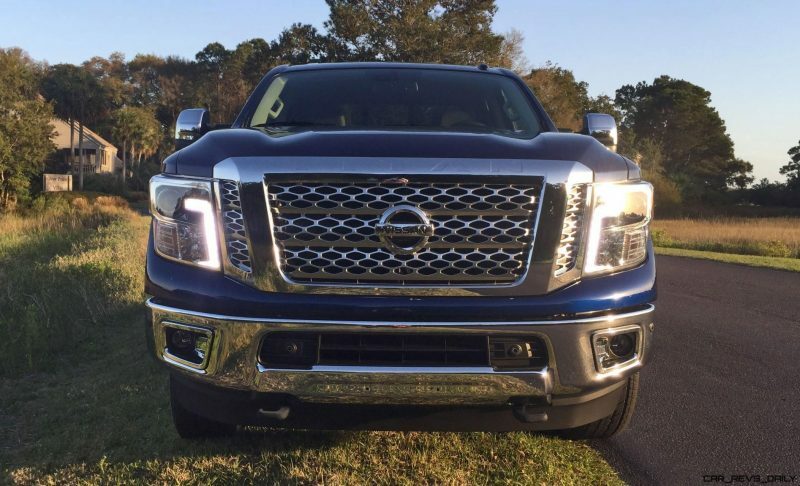 Based on Cummins very-premium pricing for its latest engines, we estimate that Nissan is kicking in $5k of their own for every single one. All in the name of trustbusting its way to the top of the pickup business! 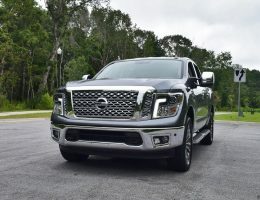 We are so on-board with the Titan XD’s unique offering that this review hopped the reviews queue — we’re that eager to share the genius of Nissan Trucks. 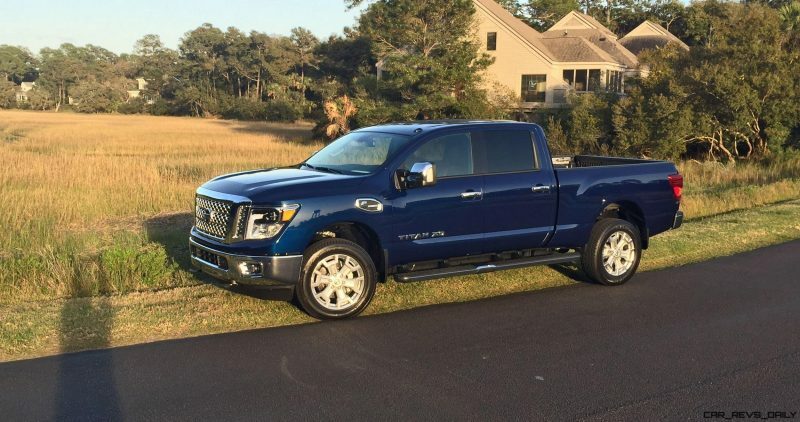 — payload is what ruins the ride and handling (plus MPG and MPH) of most HD trucks. Bottom line: a half-ton truck with giant TDV8 power is the next big evolution in the 2-million-unit annual pickup market in the USA. It is easier said than done, though. 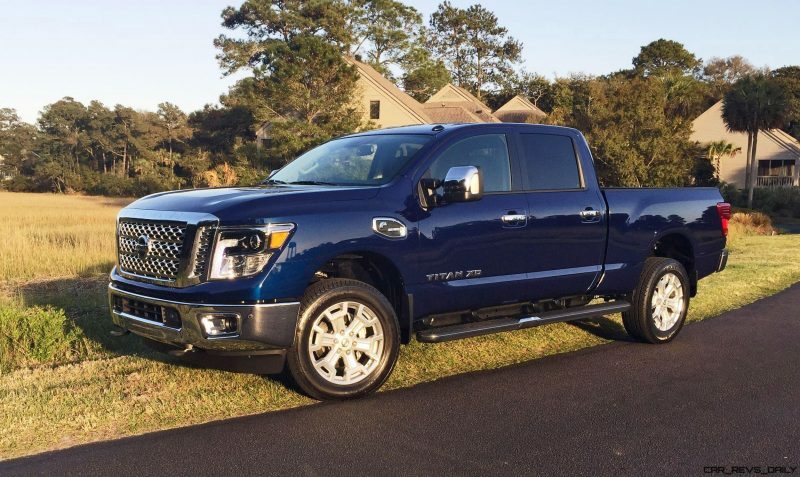 Nissan beat Ford, Ram and GMC to the punch on this by at least two years. While the new Super Duty looks posh, it will still be saddled with the inherent compromises that its F-250 status demands. Live axles, lazy automatics and pump-busting fuel thirst are set to continue on every other truck with a 10k-plus tow rating. The Titan XD solves this puzzle. Lux, powerful, affordable and worthy of long-term trust. Welcome to the XD — Every Duty — CRUSHER! 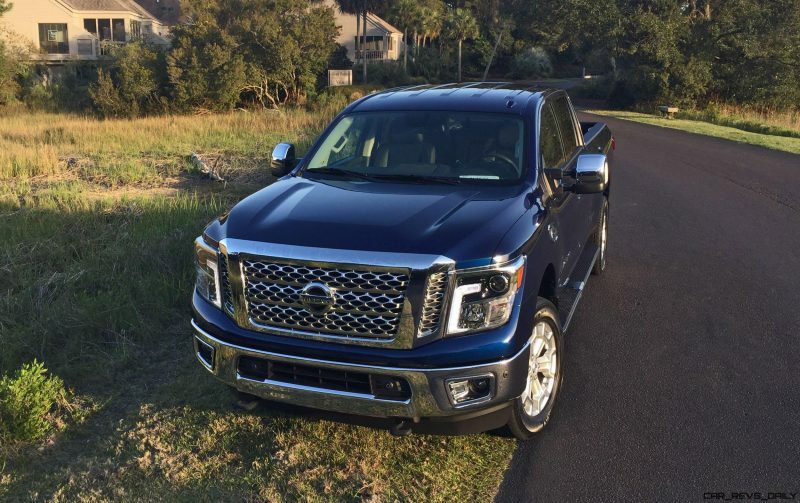 Our 2016 Car Revs Daily HD Truck of the Year. Schedule a test drive and check out the Titan XD builder over at the below link. You will be glad you did.